I’m kind of in shock. 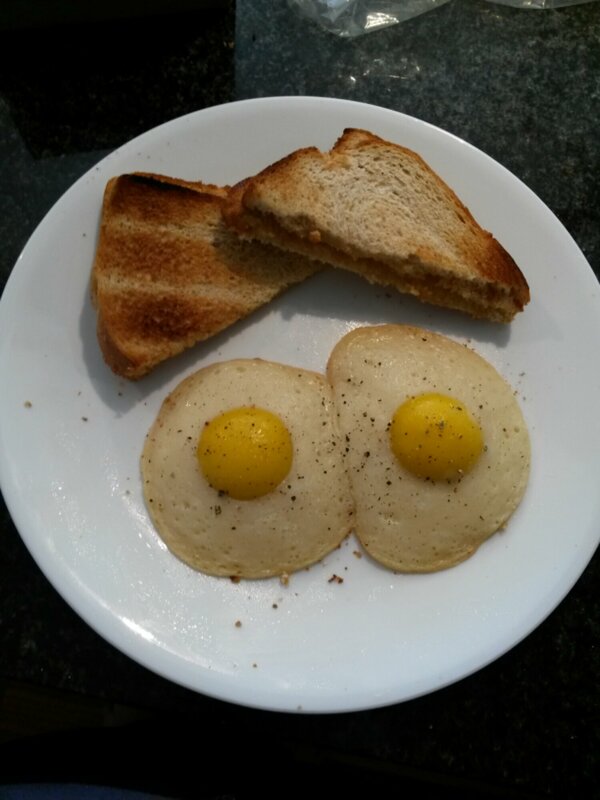 I made vegan fried eggs. I’ve been obsessed with figuring out how to do this for years. My dad used to make me eggs for breakfast every morning and I missed dippy yolks more than anything. Once I hammer out the exact measurements, I’ll post the recipe. But for now know this: it can be done! The above photo was our dinner tonight: vegan crab cakes (from the brand Sophie’s Kitchen, really tasty), roasted red pepper remoulade, and –the recipe I’m going to share with you tonight– roasted Japanese Sweet Potato slices flavored with truffle oil and black lava salt. Before anyone raises the question as to whether or not (good) truffles are vegan due to their being harvested almost exclusively using dogs or pigs, I have to tell you that almost all truffle oil has never had a truffle anywhere near it. 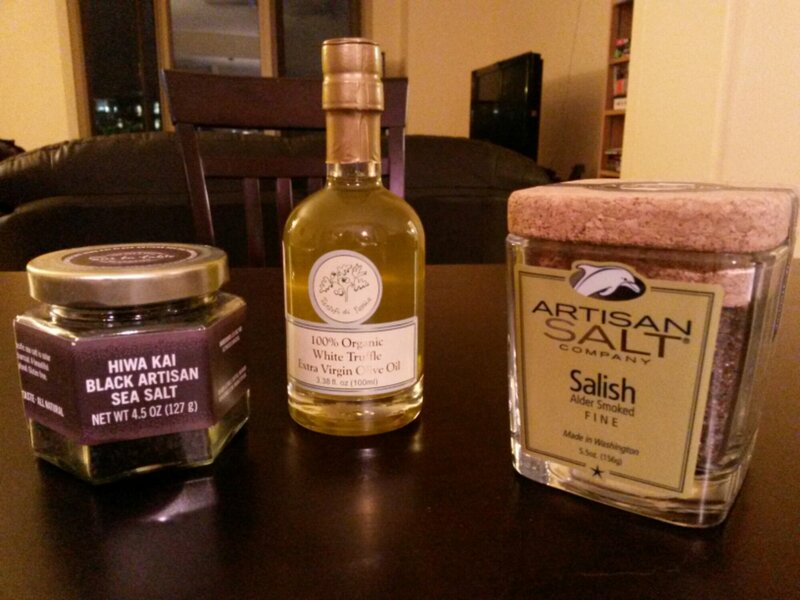 The vast majority of truffle oil is flavored synthetically. So no debate needed! While this plate looks fancy, it’s actually a quick, simple dinner. It all came together in under an hour. And most of that hour I spent on the internet looking at other Vegan MoFo posts. This is mostly due to the fact that the crab cakes were pre made. All I did was brown them on both sides. The remoulade I made is still “in development.” Which is code for “I don’t actually know what I did, but it was awesome.” Which is the reason the only recipe I’m going to share is the side dish. What the food hole had labeled as “Jewel Yams” (hence my instagram teaser yesterday) are actually Japanese Sweet Potatoes. They have a ruby red skin and creamy, white flesh. Their flavor isn’t as pronounced as the bright orange sweet potatoes common around Thanksgiving. Rather, the Japanese sweet potato has a more delicate flavor with a slight sweetness. And in this case, that made an amazing canvas for truffle oil. The inspiration for this is one of my former co-workers who used to eat beans and corn most days for lunch. This is a way to preserve that simplicity but turn it into something awesome. 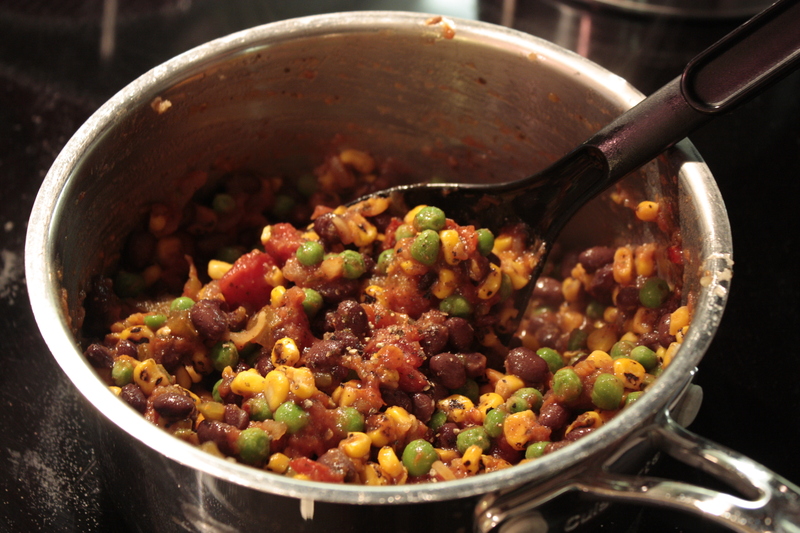 Succotash is delicious and one of the easiest things in the world to make. Don’t believe anyone who says that it should be a side dish. It is totally awesome enough to be an entrée. Editor’s Note: No I did not. I merely expressed concern that perhaps he was doing food wrong. Succotash takes 10-15 minutes, uses only a single pan, and you probably have everything you need already. 1 can black beans – rinse them first, this is very important. An equal amount of corn either caned for frozen is fine. – I’m a big fan of Trader Joe’s fire-roasted corn. Fresh Onion, Mushrooms, and/or bell pepper – dice these and saute them in the pot first so that they can brown before you add anything else. A cup of frozen lima beans, peas or shelled edamame – Lima beans are traditional but I prefer peas. And surprisingly Bacos (which are totally vegan, BTW!) – These need to go in towards the beginning. Just throw everything into the pan, heat until the salsa is bubbling. Season with Bacon Salt and Pepper to taste. 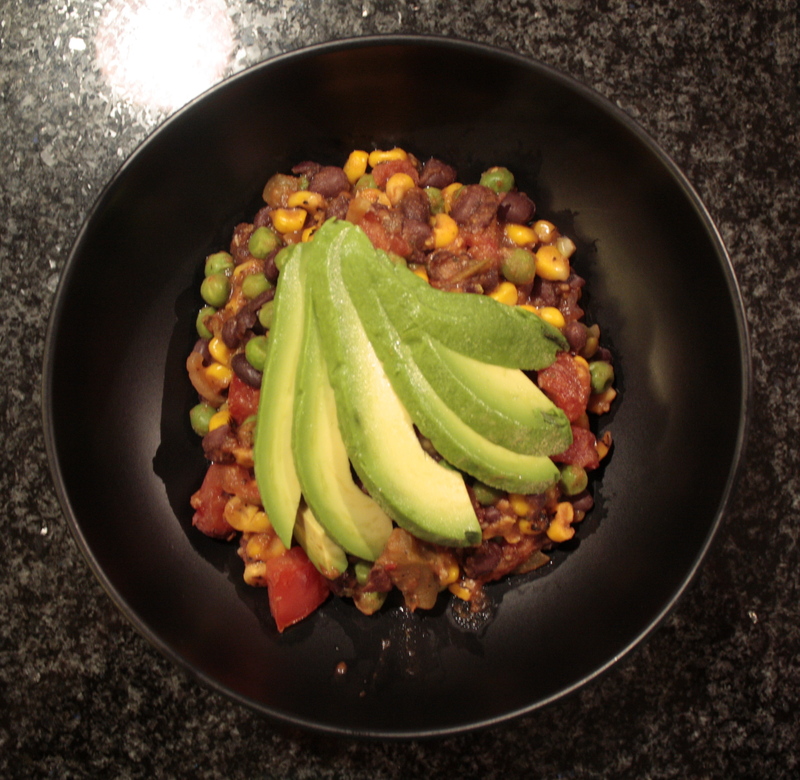 Once it’s heated, serve in a bowl with Guacamole or Avocado. 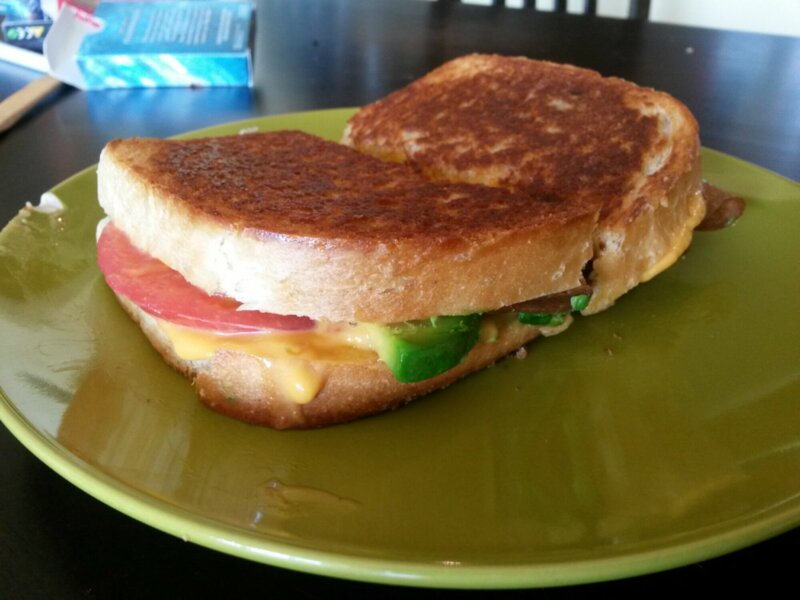 The finished version pictured up top has a tomato, garlic, peas, and avocado. It’s my Veganniversary today! YAY!!!! Tom and I are celebrating, but not until tonight. So, I thought I’d get a post in today since I was late with yesterday’s. This is the Hot Spinach Dip I mentioned in my previous post. 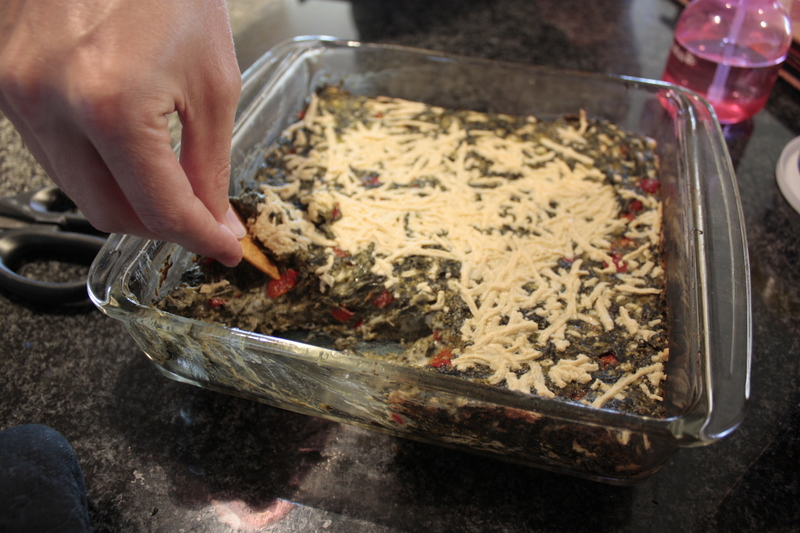 About a week ago, Tom asked me to make him some spinach dip because he was sad he couldn’t eat any of the packaged ones at the food hole (that’s his hand in the photo). So I made this one up. No idea how close it is to non-vegan spinach dip, but I can tell you that it is freakin’ tasty. 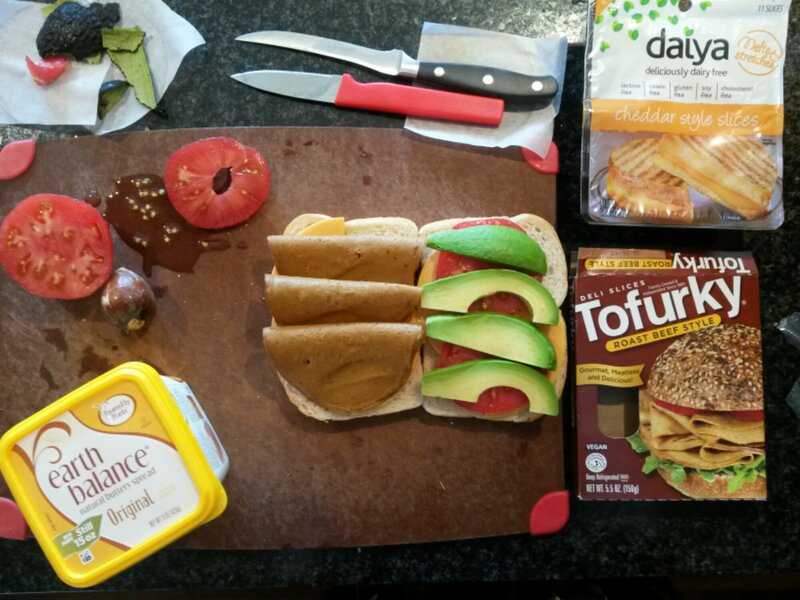 We were snacking on it while we were cooking everything else yesterday.